With perfect complimentary styles and seamlessly weaving several music genres, Dave Crumpler and Mike Glass deliver crowd pleasing acoustic arrangements of time tested favorites. Dave has played countless acoustic venues from Williamsburg to Virginia Beach since 2002. Mike is the former lead flat picker, vocalist and founding member of theAmericana string quartet The Delvers (disbanded in 2015). Dave and Mike perform over 100 shows each year. Employing their eclectic play list of over 200 songs featuring Classic Rock, Alt & Modern Rock, Americana, Bluegrass, Irish Pub Songs and more, they tailor the music to the crowd on hand. Mike’s spot-on flatpicking makes a perfect pairing for their arrangements. 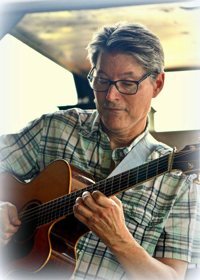 Dave’s acoustic rhythm style blends cross-picking, finger style, flat picking and rhythm techniques with influence early on from James Taylor and Neil Young.